According to Yotam Ottolenghi and Sami Tamini, from whose book this recipe comes, it's a simpler version of M'sakhan, a traditional Palestinian dish where chicken, heady with spices, is roasted over bread. There's no bread here, just spices that, I'm not going to lie, probably aren't going to be too easy to find. But sumac and za'atar are well worth seaking out. If you're in New York and you need a hint go directly to Kalustyan's and you'll find everything you need. More than everything. Just trust me. Otherwise, seek out Middle Eastern specialty stores, and you should find them easily there. The investment is well worth it, especially for recipes like these. Because essentially, you dump everything into a pan or bowl for marinating, and then stick it all directly into the oven. The ease with which it comes together belies the intricacies of the final flavors. And this, you guys, is one heluva suculent chicken. So anyway, I've never actually been to Ottolenghi, the popular London restaurant, because it's been a long, long time since I've been to London. But judging from their cookbook, I'd be a regular fixture there if it were possible. If their cuisine is defined by their use of lemon and garlic (which the chefs say it is) this recipe must be the epitome of Ottolenghi-ness. 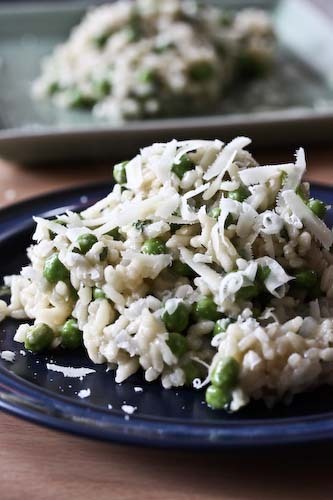 Especially if you serve it with the sauce made by mixing Greek yoghurt, crushed garlic, oilive oil, salt and pepper (in proportions to suit your taste) as they suggest. Had I read the fine print before serving, I probably would have done the same. But even without, I promise, you are going to love this chicken. 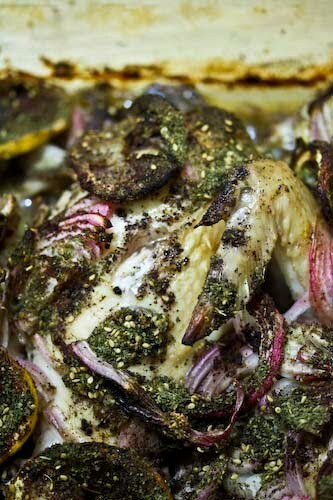 I layered the chicken with the onions, garlic, olive oil, spices (except the za'atar), lemon, stock, salt and pepper into the same dish I baked it in, rather than starting off in a bowl for marinading and then transferring it to a dish. But you can do either. Just make sure that the chicken is in a single layer and is lying skin-side up. So combine all of those ingredients and place in the refrigerator to marinate for a few hours or over night. 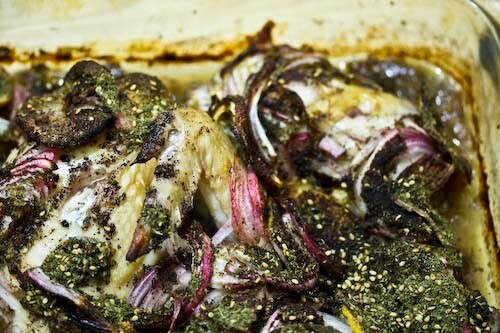 Preheat the oven to 400 F. Remove the chicken from the fridge and sprinkle with the za'atar. Put the dish into the oven and roast for 30-40 minutes. If you oven is pulling double duty with side dishes, as mine was, you might need to go for more like 50-60 minutes, but it's up to you to check. The chicken should be colored and just cooked through. In the meantime, melt the butter in a small frying pan and cook the pine nuts as well as a pinch of salt until the pine nuts are browned. You'll need to stir constantly, because you do not want to burn those expensive suckers. Spread the nuts out onto a towel-lined plate to drain. Remove the chicken from the oven, top with the pine nuts and parsley and another drizzle of olive oil if you'd like. Enjoy! Sounds great, and so easy! I missed Ottolenghi on my last trip to London, but I really hope to make it there soon!